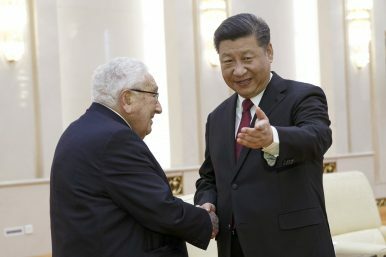 Chinese President Xi Jinping, right, shakes hands with former U.S. Secretary of State Henry Kissinger at the Great Hall of the People in Beijing, China (Nov. 8, 2018). Xi told Kissinger that China and the United States must have accurate judgments of each other’s strategic intentions. On November 8, Chinese President Xi Jinping met with former U.S. Secretary of State Henry Kissinger at the Great Hall of the People in Beijing. The Kissinger visit came ahead of a planned meeting between Xi and U.S. President Donald Trump, which is scheduled to happen on the sidelines of the Argentina G20 summit at the end of November. Yet Kissinger has been on the list of “old friends” for quite a long time. For decades, he has been regarded by Beijing as a supreme China policy guru in the United States. Most importantly, Kissinger is famous for his realist perspective in foreign policy — a school of thought which believes in order and power rather than moral philosophy as underpinning the behavior of nations. Most Chinese politicians happen to be die-hard followers of realism, too. Thus, Kissinger — different from many U.S. politicians who follow or claim to follow idealism in international relations — is seen by many Chinese politicians as a reliable American they can talk to. During their latest meeting, Xi told the 95-year-old Kissinger that China-U.S. relations have generally maintained steady progress over the past four decades despite twists and turns. Mentioning the upcoming meeting with Trump, Xi emphasized that China and the United States must have accurate judgments of each other’s strategic intentions. Adhering to the path of peaceful development, China remains committed to developing Sino-U.S. relations featuring non-conflict, non-confrontation, mutual respect, and win-win cooperation. We are willing to properly resolve the problems between the two countries through friendly consultations on the basis of equality and mutual benefit. At the same time, the U.S. side should also respect China’s right to choose its own way of development and China’s legitimate interests. [The United States should] walk along with China to jointly safeguard the healthy and stable development of Sino-U.S. relations. Reading between the lines, Xi was asking Kissinger — the world-famous realist — to bring the message back to Trump that China is willing to reach an agreement — including sacrificing some of the country’s interests on trade — with the United States during the upcoming Trump-Xi meeting, as long as the United States doesn’t touch upon those fundamental issues which could harm the Chinese regime. Under the current situation, U.S.-China cooperation is crucial to world peace and prosperity. I highly appreciate China’s efforts… The United States and China must better understand each other, strengthen strategic communication, continuously expand common interests, properly manage differences, and show the world that the common interests of the two countries are far greater than the differences. Kissinger’s visit comes amid some other signs of a thaw in U.S.-China relations ahead of the Trump-Xi meeting. Trump, China, and Ah QWhat Do China’s Military Hawks Think of Trump?Despite Its Global Expansion, China Stresses No Intention to Displace USWhere Was Taiwan in the Trump-Xi Meeting?Trump-Xi Summit: Much Ado About Nothing?